An elongated, asymmetrical, swirling shawl that uses two colors, and simple knit, increase and decrease stitches to achieve a striking shape. Cast on with 3 stitches at one corner, Swirligig grows asymmetrically on the bias; adding stitches to each triangular section, while at the same time shifting the triangles by increasing and decreasing on a bias tilt. The garter stitch wedges are set off by swirling lines of YOs, and a matching line of YOs finishes the long edge. Techniques & Skills Used: knit, increasing/decreasing; this pattern includes written instructions, as well as a stitch count table. Size: 18” deep at larger end and 112” long on outer edge, after blocking; Swirligig forms a spiral shape narrowing from one wide end to the other pointed end. 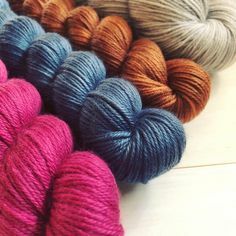 Yarn: Madelinetosh Tosh Sock (100% superwash merino, 395 yards/100g); 1 skein MC and 1 skein CC, shown in Logwood (MC) and Ginger (CC). As written, this shawl uses approximately 380 yards of MC, and 295 yards of CC. Other Materials: US 6 (4mm) 40” circular needle; Stitch Markers (8); Yarn needle. Gauge: 20 st and 40 rows/4” in garter stitch. 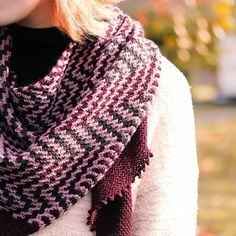 Gauge is not critical for this project, however a different gauge may result in a smaller or larger finished shawl, and different yardage requirements.